A city's landmark was lit to honour two brothers killed by a speeding car in Coventry one year on from their deaths. Casper Platt-May, two, and Corey, six, were knocked over by a driver high on drugs as they crossed MacDonald Road on 22 February. 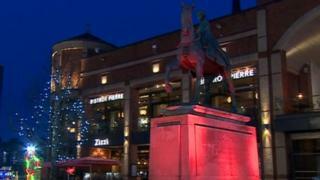 The Lady Godiva statue and parts of the centre were illuminated in the red of their favourite football teams. Robert Brown, 53, who was jailed over the deaths, was found dead in prison on Christmas Day. Casper and Corey were with their mother Louise on the way to a park when they were hit by Brown's Ford Focus. The boys were taken to hospital, but later died. Corey was a keen footballer and supported Manchester United. Casper had started to develop an interest in the sport and other members of their family are fans of Liverpool. Last May, the boys' father Reece Platt-May was found dead in a hotel in Greece. Passers-by said the city centre's red tribute "showed support" to the family and was a "wonderful" touch. People were also encouraged to light a candle to ensure their memory would not be forgotten. Corey's football coach Matthew Hopkins said: "It's given them (the family) a little bit of solace that they know the city is behind them." City councillor Patricia Hetherton added: "It's a time of remembrance and reflection to think of those two little boys, to make sure they are not forgotten." Brown, of Attwood Crescent, Wyken, and his passenger Gwendoline Harrison had tried to flee the scene of the collision on foot - but members of the public attempted to stop them. Brown admitted causing the boys' deaths by dangerous driving and had his sentence increased last July from nine years to 10-and-a-half. West Midlands Police said Brown, who had taken cocaine, diazepam and zopiclone, was driving at more than 60mph. Harrison, 42, admitted a charge of assault intending to resist arrest and was jailed for six-months.